Our Recycling Point at the camp has now been tidied up. New signage to help direct folks to the bins is coming soon from PKC. Until then, you can find them at the back of the camp opposite the old nuclear bunker. 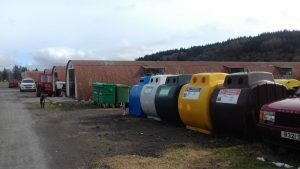 Please remember these bins are sited amongst our Commercial Huts… so take care as it can be a busy place.